Dr. Gopal Raghav Poduval has 17 years of experience as a physician in the Armed Forces. Have worked in large military hospitals practicing ethical medicines and medicine as per the standard guidelines. Voluntarily retired from the services in 2006 and got trained in Neurology at CARE Institute of Neurosciences, Hyderabad. Have 13 years of experience as a Consultant Neurologist. Trained in Movement Disorders at Queen Square at University College of London in Sep 2016. 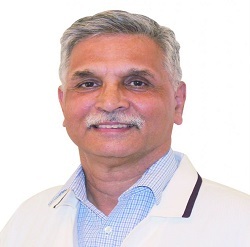 He completed MBBS from University of Poona in 1981,MD -Medicine from A.F.M.C Pune in 1988 and DNB – Neurology from National Board of Examinations Ministry of Health Government of India in 2009. He is a member of Indian Medical Association (IMA). Few services provided by him are comprehensive management of movement Disorders including Parkinson’s disease, Botulinum Toxin Therapy, Neurointensive care etc.